Kayaks began lining up on the shores of Seattle’s Elliot Bay early Saturday morning in preparation for the sHell No! 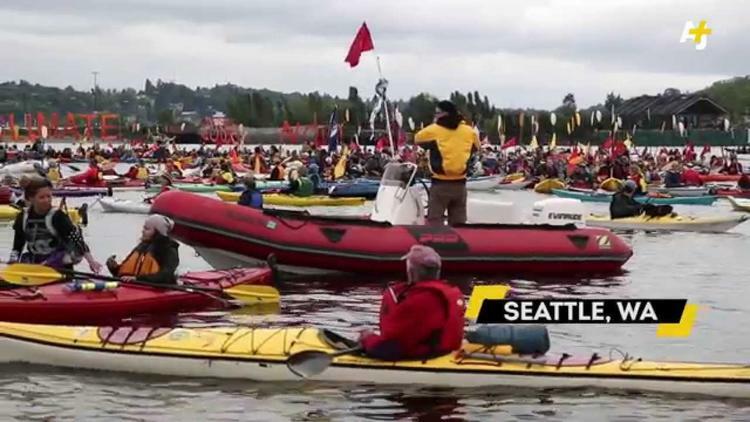 “flotilla rally,” organized by social and environmental justice groups in opposition to Shell Oil’s plans to drill for fossil fuels in fragile Arctic waters. Over the vocal objections of Seattle’s mayor and city council, as well as a large swath of the general public, the oil giant intends to use the Port of Seattle as a staging ground for its drilling operations off the northwest coast of Alaska. To the dismay of environmentalists, the Obama administration earlier this week granted Shell conditional approval to resume those operations. About 20 paddling activists rolled out the un-welcome mat for the ‘Polar Pioneer’—one of two hulking rigs chugging into the Port of Seattle this week—on Thursday. Thousands are expected to participate in Saturday’s land and sea demonstrations, which will be followed by a mass direct action, aimed at shutting down Shell, on Monday.